Please refer to the table below when puchasing tickets on the day of travel. Day tickets are only available_on the day of your visit. There are no advance sales for day tickets. 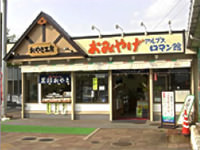 The ticket is valid for 5 days after the purchase date. This is not a ‘free ride’ (unlimited travel) ticket. Tickets can be paid for by cash or credit card. 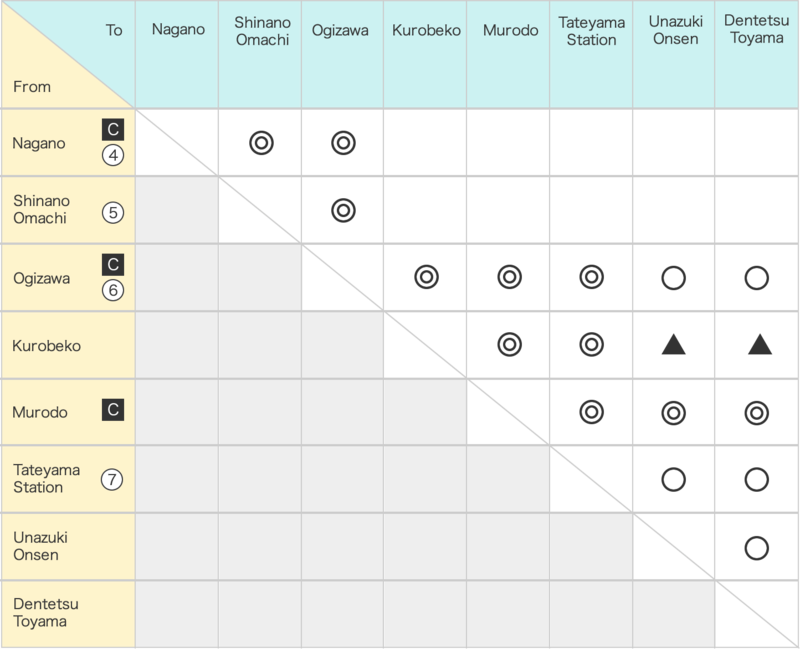 Stations that accept credit card are marked in the table below. 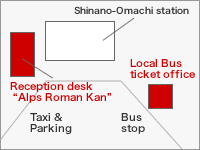 The JR Japan Rail Pass cannot be used on the Alpine Route. 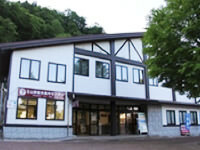 It can be used between Shinano Omachi and Nagano Stations by JR.
Tickets go on sale at Tateyama Station and Ogizawa 40 minutes before the first departure. Depending on the congestion situation, it may take some time to purchase your ticket. On busy days, the sale of tickets for certain sections and round trip day tickets may be restricted. 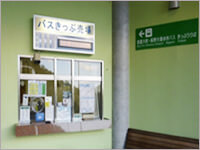 When riding the Tateyama Cable Car from Tateyama Station or the Kanden Tunnel Electric Bus from Ogizawa, please take the vehicle departing at the time indicated on your ticket. 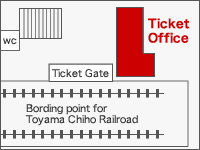 Please note that this designated boarding time only applies on the day the ticket was purchased. If you wish to ride the Tateyama Cable Car (from Tateyama Station) at a specific time, please use the web ticket reservation on the Tateyama Kurobe Alpine Route Official Site. Please note that the number of advance ticket reservations is limitied. 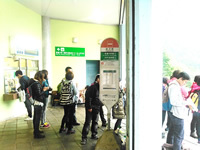 Online booking is not possible for the Kanden Tunnel Electric Bus. 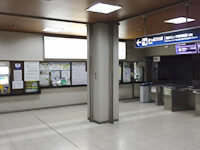 At other stations, please line up at the vehicle boarding gate. 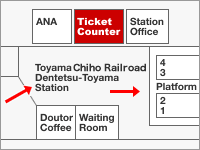 You can buy tickets for the Dentetsu-Toyama- Ogizawa route at the Dentetsu-Toyama Station. 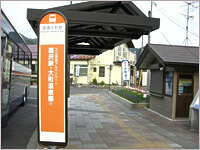 Please purchase at Ogizawa Station for between Ogizawa and Omachi Onsen, Shinano Omachi. When using a baggage forwarding service, time is needed to arrange so please arrive to board 20 to 30 minutes early. 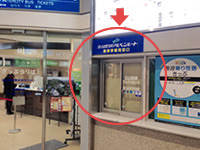 Outside of the above hours, please purchase a ticket to Tateyama Station from the ticket machines, and then purchase your Alpine Route ticket at Tateyama Station. 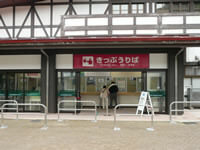 Tickets for all stations up to Dentetsu Toyama Station are available here. 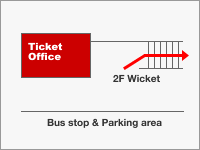 If you buy tickets here, you no longer need to buy a new ticket for each transportat link along the route. 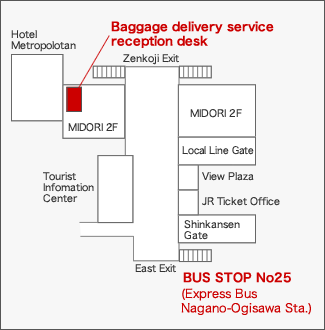 A baggage delivery service is available here. 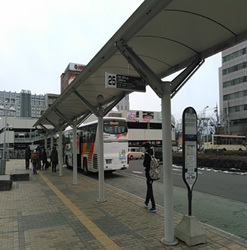 Please purchase tickets for the Local Bus between Ogizawa and Shinano Omachi Station, or for the Express bus between Ogizawa and Nagano Station here. It is not possible to get a refund if you purchase a full ticket but get off at an earlier stop. Please be sure to buy a ticket only as far as your destination. 1) Please purchase tickets on the bus. Have change ready. 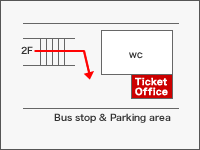 1) Bus tickets to Ogizawa are available here. 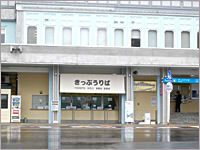 2) A baggage delivery service is available at “Alps Roman Kan” next to JR Shinano Omachi Station. There is no baggage delivery service at Ogizawa. There is no baggage delivery service here. 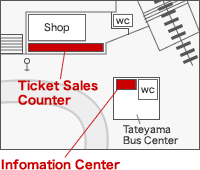 Please purchase tickets to Toyama Station or Unazuki onsen from the ticket machines on the first floor of Tateyama Station.